Shah Jahan was the son of Jahangir and grandson of Akbar, two of the great Mughal emperors of the late sixteenth and early seventeenth centuries. Born as Khurram, he took the name Shah Jahan upon ascension to the throne in 1627. Like his predecessors, he was a patron of the arts, and one of the great architectural works of the time, the Taj Mahal, was commissioned by him in 1631 as a tomb for his deceased queen, Mamtaz. Shah Jahan’s reign saw the beginning of the Marathas’ revolt, which would continue well after his death. His last nine years were marked by illness and imprisonment as his four sons fought for control of the empire; he died in 1666. 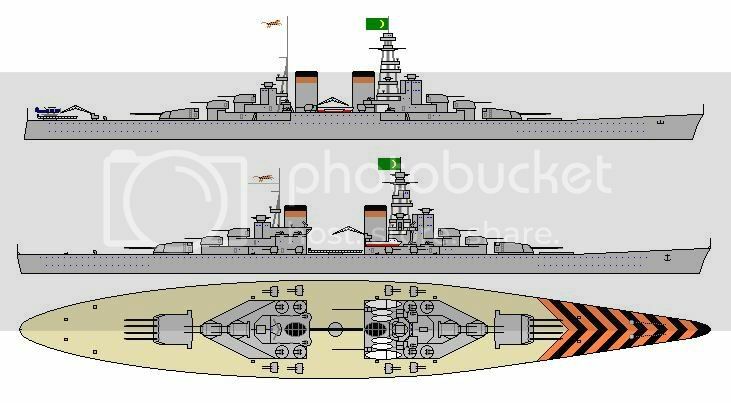 The Akbar class battleships, laid down in 1924, were India’s first domestically built capital ships. Small by contemporary standards, the size allowed India to plan for three similar ships, which would ensure that one could be out of service for refits and still leave India with two vessels. The class was generally considered successful, being well armored, fast, and with a decent armament, the primary concerns being the thickness of the deck armor and the concentration of the main battery into just two turrets. That said, the primary battery has proven effective, the turrets proving spacious, with adequate ammunition handling, and sufficient barrel spacing to minimize dispersion. The secondary battery is also continued, with the layout allowing all guns to fire on either beam. A nice drawing as usual. One thing though, I'd love to see her and Akbar compaired to one another in a drawing. The midships catapult strikes me as a waste of deck space in it's current configuration. Raising it above the superstructure (as in the Twins and Hipper class), or a Bismack/KGV fixed catapult would be far more efficient, no? Or twin the existing one and make em flush with the superstructure edge. Deck armour. Isn't 30mm thick over the steering gear kinda poor? It means that a destroyer can cripple her with gunfire. I'll send you a spreadsheet that'll hopefully give you something to play around with more. Isn't the cresent moon on the flag the wrong way around? The midships catapult doesn't need to rotate, it could only fire off aircraft whilst across the deck. She seems a logical progression from Akbar. Thanks for the comments. I should point out, given Wes' comments, that he did the actual simming of the ship based on constant yakking with me. We designated this version "N for Nirvana"
The cat is a headache. I'm not precisely sure how a fixed-track works, whether it's a two-way device or whether it launched to either side from the middle. At any rate, the wingspan fo the scouting aircraft is not much less than the space between structures, so the presence of the rotating cat doesn't affect a lot there. I think I've managed to arrange the tertiary and light battery to overcome the cat's presence. I didn't want to raise the cat one level because then I reckoned the hangers would need to move up as well, forcing the aft superstructure to be quite tall and blocky (more so than already. The flag flies correctly when viewed from the port side. I'll have a look at the spreadsheet when it arrives and perhaps revise the deck armor layout accordingly. Ah, man, the cranes too? Hadn't thought about the redundancy issue. Perhaps I'll be back to the drawing board after all. The 15 cm are the same size as those seen on my CLs, just as the 35 cm mounts are similar in dimension to KGV quads. I wish I could remember what I'd based the CL gun size on - probably a German design - but I can't. As for raising the cat a la the Twins/Hipper, where exactly were their hangars located? "Beats the heck outta me", probably answers both of those questions, I'm afraid. No hangars for either. 1 carried on midships catapult, one on the aft turret catapult. Where are the directors for the secondary and tertiary guns? I can see 2 smaller directors on the pagoda, but thats all. There's a small director on either side of the pagoda, and a third atop the forward superstructure. I'm open to suggestions as to numbers. - The Jack flies from the Jackstaff all the way at the stem (101x67.5 cm). Can't find it in the Hood book, but the cover picture shows Hood flying the Admiral's flag (Rear admiral to be exact) from the fore topmast and the Navy Ensign from the ensign staff at the stern. I would say that India's "Leaping Tiger" flag would be the Battle Ensign and the national flag in its current size should be on the Ensign staff at the back. If you were to shrink that flag (about 50%), it could be the Admiral's flag. Agreed, the cat does take a lot of space away, but I'm trying to avoid employing too much hindsight here. The AA battery has already doubled from the preceding class; it might be considered adequate for the foreseeable future. Anyway, I expect India would end up removing the 15 and 10.5 cm mounts and replacing them with 8x2 or 12x2 12.5 cm DP twin mounts some time in the late thirties. I think that'd be a reasonable AA fit for a ship of this size. So that could be the case with the pictures of India's BBs. (*) Battleship of the Scharnhorst class by Gerhard Koop and Klaus-Peter Schmolke. Have we got a picture of her with a cross-deck catapult yet J? if with cross-deck catapult, raise the portion amidships by 1 deck giving her a more similar appearance to Akbar? FC directors. The two main directors are ok. What scale are you using btw? 1:40? That gives directors of ~8m which is enough when combined with the 15m turret mounted ones. For 150mm guns, probably 1 director each beam, or 1 fore and aft. AA directors are still fairly rudimentary. No modification yet - other priorities. Though I did like the suggestion that two cats might be better, providing redundancy. The scale is one pixel to a foot.